Tempe Empty Bowls is a great way for people to help the needy in our community. Thousands of Tempe-area elementary and high school area students, as well as local artists, create clay bowls and other pottery to help raise money for the hungry in our community as part of the Tempe Empty Bowls program. Proceeds benefit the feeding programs at the Tempe Community Action Agency and the United Food Bank. At the event, $10 purchases a bowl and a simple meal of soup and bread, symbolic of the caloric intake that must sustain people in our community for an entire day. The soup for Tempe Empty Bowls will be provided by NCounter and Whole Foods Market! On February 24th they will set up at 6th Street and Mill Avenue. The music entertainment will be provided by the wonderful Mr. Walt Richardson and the soup will be donated by NCounter. On February 25th, they will set up at the Tempe Library Complex at the SW corner of Rural and Southern. The music will be provided by Randy Olson and Friends and the soup will come from Whole Foods. 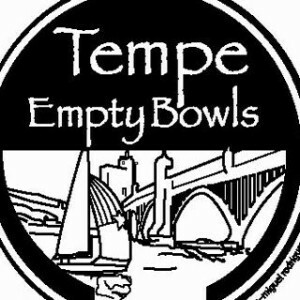 To learn about the Tempe Empty Bowls events, please see their web page and their Facebook page for more information. Tempe Empty Bowls – Shop For a Cause! Don’t forget to shop for a cause! You can help alleviate hunger in Tempe by purchasing these beautiful pottery bowls that are handmade by local artists and students across Tempe! Over the past 16 years, Tempe Empty Bowls has raised more than $175,000 to provide food for hungry kids, families and seniors in our Tempe community. Funds raised through this incredible community fundraiser benefit hunger relief programs operated by TCAA and the United Food Bank.